This week, we received some very exciting news: Cherry Hill has officially been designated as a "Healthy Town" for our implementation of my Mayor's Wellness Campaign, and the community's strong support of the program. "Healthy Town" status is the top designation given to municipalities by the New Jersey Mayors Wellness Campaign. Cherry Hill is just the 16th municipality in New Jersey to receive the designation, and is the only "Healthy Town" in South Jersey. This is very exciting news for our entire community! I want to thank all of our Wellness Partners and the thousands of residents who have taken part in our Wellness events in the last two years, for helping to make the program so successful. Click here to for additional information. 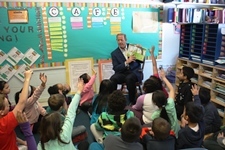 This week, I had the pleasure of joining students at several Cherry Hill schools to celebrate Read Across America Week. Held the first week in March every year, Read Across America promotes literacy and learning among students, and coincides with the birthday of beloved children’s author Dr. Seuss. This is always a wonderful event across Cherry Hill, and I enjoy being a part of the festivities. This year, I read “Wacky Wednesday” to students at Clara Barton Elementary, “The Cat in the Hat” to Temple Beth Sholom students, and “The Lorax” to fifth-graders at Stockton Elementary School. I want to thank the schools for inviting me to be a part of this year’s festivities, and the teachers and students for welcoming me into their classrooms. I am already looking forward to next year! On Thursday evening, Council President David Fleisher and I attended the swearing-in ceremony for two members of the Cherry Hill Board of Fire Commissioners, Robert Campagna and Bill McCargo, who were elected in February’s Fire District elections. Council President Fleisher administered the Oath of Office to both men, who were joined by their families for the special ceremony. I know that Commissioners Campagna and McCargo will represent the people of Cherry Hill with honor and help preserve the Cherry Hill Fire Department’s tradition of excellence. Please join me in congratulating both of our newest Fire Commissioners. Cherry Hill will host a free, daylong Conference for Professionals and Parents of Children with Special Needs, from 8:30 a.m. to 1:30 p.m. Saturday, March 8, at the Carman Tilelli Community Center. Learn about a variety of topics and issues, and connect with representatives from federal, state and local agencies, as well as two special featured speakers. The conference is hosted by Cherry Hill Township, the Ombudsman for Disabled Citizens and the Cherry Hill Alliance, and is sponsored by the Ellisburg McDonald’s and Wegmans. A continental breakfast will be served. Attendance is free. Click here for more information. The Cherry Hill Department of Engineering expects to resume work on the 2013 Road Maintenance Program late next week. Road work is scheduled to begin Thursday, weather-permitting, on Cooper Avenue between Jefferson Avenue and Park Drive. The project is expected to take about two weeks to complete, and will include concrete repairs and road resurfacing. Residents in the neighborhood will be notified of the work early next week. Several roads are scheduled to be repaved this spring as part of the Questions or concerns should be directed to the Engineering Department at (856) 424-3203. On Saturday, March 1, Councilman Jim Bannar and I were on hand for the official grand opening of Republic Bank’s newest South Jersey location, at 399 Route 70 East. The daylong event featured family-friendly activities, including face-painting, dancing and free giveaways, and included a special ribbon-cutting ceremony at noon. Republic Bank has constructed a beautiful facility on Route 70, complete with a stunning, backlit photo of the old Garden State Racetrack that is visible from the road at night. Cherry Hill is happy to welcome Republic Bank into our community, and we look forward to working with bank officials through the Township’s Business Council and at other community events in the months and years to come. Food, music and fun activities with a techie, DIY spin. Make a mini-button with our button-maker, try out new apps and digital games, create 8-bit-inspired crafts, play videos games on our big screen, and much more! Open to grades 6-12. Free. No registration. Join us for a discussion on 60 useful apps. We will focus mainly on free apps for Apple, Android or Kindle Fire devices. Free. No registration. 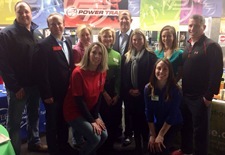 Red Cross Community Blood Drive, Monday, March 31, 2-7 p.m.
Last weekend, I joined Council President David Fleisher and Councilwoman Carole Roskoph at the Power Train Sports Institute to kick off a special daylong Fitness and Wellness Expo with the Mayor's Wellness Campaign. The event introduced visitors to the training facility and a variety of local health-oriented vendors. The Mayor's Wellness Campaign was on hand, encouraging guests to take the Mayor's Wellness Pledge, and sharing information on nutrition and upcoming Wellness events in Cherry Hill. Power Train is one of our newest Wellness Partners, and the Township was excited to be a part of their first-ever Wellness Expo. We look forward to working together again in the future! Registration is now open for all spring recreation programs, and the Cherry Hill Recreation Department is gearing up by offering residents a chance to explore the variety of programs offered at a special open house event, from 6 to 8 p.m. Thursday, March 20, at the Croft Farm Arts Center. Guests will have a chance to meet class instructors and learn more about the many classes offered each season at historic Croft Farm. Bring your whole family and enjoy live demonstrations and hands-on activities. Spotlighted classes include dance, fitness, mommy and me, painting, drawing, fashion design, and much more. Refreshments will be served. This event is free to attend, but registration is requested. To register for the Open House, email Recreation@chtownship.com or call (856) 488-7868. For more information, including a complete listing of Spring 2014 classes, click here. To register for a program, visit https://reconline.cherryhill-nj.com/. The Cherry Hill Education Foundation is pleased to present the 2014 “Dancing with the Cherry Hill Stars” on Sunday, May 4 at 7 p.m. in the Auditorium at Cherry Hill High School West. Sixteen couples, including teachers, students, school administrators, alumni and members of the business community, will compete in an exciting contest to raise money for the Cherry Hill Public Schools. Special performances by the Cherry Hill School Board (with students), and by last year’s “Jersey Boys” will enhance the show. Guest celebrity judge, Jeremiah Trotter, will join the judges’ table with Marjie Major, Katie Nanni and Arnie Silver. Music by East’s Orchestra will add to the elegance of this “Hollywood” evening. Tickets are available online at www.cherryhilleducationfoundation.com or in the Activities Offices at Cherry Hill High School East and West. Online voting for your favorite dancing couple is also available on the Education Foundation’s website. Last Saturday, members of Council and I helped celebrate the grand reopening of Dunkin' Donuts in the Liberty Bell Plaza on Route 70. Hundreds of residents were on hand for the event, along with the store’s owner and employees, and a Dunkin Donuts mascot. It was a fun and festive morning for all involved. Congratulations to Dunkin' Donuts, and thank you for inviting Cherry Hill to be part of the celebration! Camden County wants to hear from local residents to make sure the health and well-being needs of individuals impacted by Superstorm Sandy are addressed. To assist in this effort, the County has issued a survey that will assess the effectiveness of the original outreach for Superstorm Sandy. Although Camden County was less impacted than other areas in the State, there were several dozen residents in Cherry Hill that registered for assistance through the Federal Emergency Management Agency (FEMA). There also may be other residents throughout the County who did not contact any agencies for assistance for property damage because they were unaware, met up with barriers to receive assistance, or were overwhelmed by the event and continue to have health and wellness unmet needs. Click here to read more and to take the survey. The Department of Public Works continues working to repair hundreds of potholes across Cherry Hill, caused by this extremely cold and snowy winter. Remember that you can report a pothole on any local street 24 hours a day, 7 days a week through the new Report a Pothole feature on the Township website. You may also report potholes by calling Public Works directly at (856) 424-4422. Potholes reported to us on state- and county-owned roads will be referred to the proper authorities. Click here for additional information. Thank you in advance for helping to keep our roads safe as we emerge from winter and look toward spring. This week, we received some very exciting news: Cherry Hill has officially been designated as a "Healthy Town" for our implementation of my Mayor's Wellness Campaign, and the community's strong support of the program. "Healthy Town" status is the top designation given to municipalities by the New Jersey Mayors Wellness Campaign. Cherry Hill is just the 16th municipality in New Jersey to receive the designation, and is the only "Healthy Town" in South Jersey. This is very exciting news for our entire community! I want to thank all of our Wellness Partners and the thousands of residents who have taken part in our Wellness events in the last two years, for helping to make the program so successful. Click here [http://www.cherryhill-nj.com/CivicAlerts.aspx?AID=464] to for additional information. Cherry Hill will host a free, daylong Conference for Professionals and Parents of Children with Special Needs, from 8:30 a.m. to 1:30 p.m. Saturday, March 8, at the Carman Tilelli Community Center. Learn about a variety of topics and issues, and connect with representatives from federal, state and local agencies, as well as two special featured speakers. The conference is hosted by Cherry Hill Township, the Ombudsman for Disabled Citizens and the Cherry Hill Alliance, and is sponsored by the Ellisburg McDonald’s and Wegmans. A continental breakfast will be served. Attendance is free. 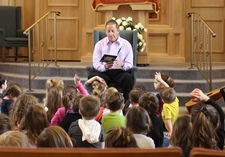 Click here [http://www.cherryhill-nj.com/DocumentCenter/View/2116] for more information. Teen Tech Week Kick-off Party, Saturday, March 8, 2:30-4 p.m.
60 apps in 60 minutes, Tuesday, March 11, 10-11 a.m. Registration is now open for all spring recreation programs, and the Cherry Hill Recreation Department is gearing up by offering residents a chance to explore the variety of programs offered at a special open house event, from 6 to 8 p.m. Thursday, March 20, at the Croft Farm Arts Center. Guests will have a chance to meet class instructors and learn more about the many classes offered each season at historic Croft Farm. Bring your whole family and enjoy live demonstrations and hands-on activities. Spotlighted classes include dance, fitness, mommy and me, painting, drawing, fashion design, and much more. Refreshments will be served. This event is free to attend, but registration is requested. To register for the Open House, email Recreation@chtownship.com [mailto:Recreation@chtownship.com] or call (856) 488-7868. For more information, including a complete listing of Spring 2014 classes, click here [http://www.cherryhill-nj.com/DocumentCenter/View/2146] . To register for a program, visit https://RecOnline.CherryHill-NJ.com [https://reconline.cherryhill-nj.com/] . The Cherry Hill Education Foundation is pleased to present the 2014 “Dancing with the Cherry Hill Stars” on Sunday, May 4 at 7 p.m. in the Auditorium at Cherry Hill High School West. Sixteen couples, including teachers, students, school administrators, alumni and members of the business community, will compete in an exciting contest to raise money for the Cherry Hill Public Schools. Special performances by the Cherry Hill School Board (with students), and by last year’s “Jersey Boys” will enhance the show. Guest celebrity judge, Jeremiah Trotter, will join the judges’ table with Marjie Major, Katie Nanni and Arnie Silver. Music by East’s Orchestra will add to the elegance of this “Hollywood” evening. Tickets are available online at www.cherryhilleducationfoundation.com [http://www.cherryhilleducationfoundation.com/] or in the Activities Offices at Cherry Hill High School East and West. Online voting for your favorite dancing couple is also available on the Education Foundation’s website. Camden County wants to hear from local residents to make sure the health and well-being needs of individuals impacted by Superstorm Sandy are addressed. To assist in this effort, the County has issued a survey that will assess the effectiveness of the original outreach for Superstorm Sandy. Although Camden County was less impacted than other areas in the State, there were several dozen residents in Cherry Hill that registered for assistance through the Federal Emergency Management Agency (FEMA). There also may be other residents throughout the County who did not contact any agencies for assistance for property damage because they were unaware, met up with barriers to receive assistance, or were overwhelmed by the event and continue to have health and wellness unmet needs. Click here to read more and to take the survey [http://camdencounty.us1.list-manage2.com/track/click?u=3ec82ce3aeb0b82c62064d641&id=a0f35ba826&e=8b5625feaf] . The Department of Public Works continues working to repair hundreds of potholes across Cherry Hill, caused by this extremely cold and snowy winter. Remember that you can report a pothole on any local street 24 hours a day, 7 days a week through the new Report a Pothole [http://www.cherryhill-nj.com/FormCenter/Roads-8/Report-a-Potholes-45] feature on the Township website. You may also report potholes by calling Public Works directly at (856) 424-4422. Potholes reported to us on state- and county-owned roads will be referred to the proper authorities. Click here [http://www.cherryhill-nj.com/CivicAlerts.aspx?AID=460] for additional information. Thank you in advance for helping to keep our roads safe as we emerge from winter and look toward spring.